Do mass demonstrations lead to policy changes? 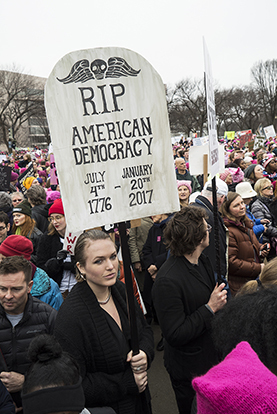 Dissent has always been part of American politics, but scholars say Donald Trump's election has sparked a heightened era of protests reflecting the country's deep ideological polarization. Fueled by social media, demonstrations have arisen over Trump administration policies on such issues as health care, climate change and immigration. Meanwhile, alleged police brutality and the removal of Confederate monuments have aroused mass protests, some violent. And on college campuses, students have clashed over whether right- and left-wing provocateurs should speak at public forums. In addition to using street protests, conservatives for decades have turned to ballot measures to oppose abortion, and more recently the tea party movement rallied against the Affordable Care Act and other policies championed by former President Barack Obama. But experts say the size and stridency of today's protests are reminiscent of the civil rights and anti-Vietnam War movements of the 1960s. Still, skeptics question whether street protests can change government policy, and some states are cracking down on protests that become disruptive or violent.